The community gathered for the I'm So Newburgh Stop the Violence event which took place in Downing Park on Saturday, August 23, 2014. 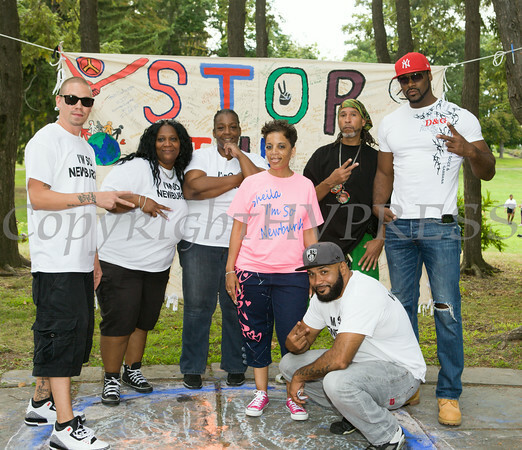 DJ G Rock, Rasheda Worth, Jan Murchison, Sheila Murphy, Joe "Flo" Alvarez (in front), Omari Shakur and James (Angel Sstar) Thorpe planned and organized the I'm So Newburgh Stop the Violence event on Saturday, August 23, 2014 in Downing Park. Hudson Valley Press/CHUCK STEWART, JR.